Rainbow Swiss chard is distinguished by its bouquet of wrinkled, slightly savoyed rich green and bronze leaves and bright colored stems. The leaves grow upright and tall from a dense rosette of ribbed stems in a myriad of colors including gold, pink, orange, purple, red, and white with bright and pastel variations. Rainbow Swiss chard is not unique from other chards in its subtle earthy flavors along with slight notes of tang, due to its betalain pigment content. The leaves are succulent and tender when young, the stems, fibrous and sometimes bitter and inedible. Rainbow Swiss chard is available year-round. Rainbow Swiss chard, also known a 5-color Silverbeet and Bright Lights, botanical name Beta vulgaris subsp. cicla var. Flavescens, is a heritage leafy green often referred to as leaf beet. Chard is distinguished from beets by its lack of enlarged fleshy underground beet. A shared characteristic of both beets and Rainbow Swiss chard is a visible one. They both contain the compound, betalain. Betalains are nitrogen-containing water-soluble compounds that are found only in a limited number of plant lineages. To the naked eye they are simply pigments of red and yellow hues. But in nature, these betalains act as a source of survival, protecting the plant from UV rays while also attracting insects and bees for pollination. Chard is known to be a nutritional powerhouse vegetable packed with vitamins, nutrients and health benefits. 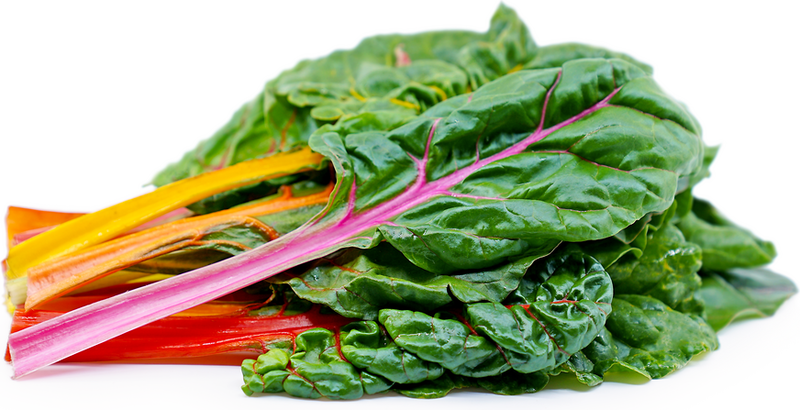 Rainbow Swiss chard contains high levels of vitamins C, K, E, beta-carotene and the minerals manganese and zinc. As noted, it also contains betalain.  Betalin pigments have repeatedly been shown to support activity within the body's detoxification process, activating and processing unwanted toxic substances. Betalians are not heat-stable, though, so longer cooking times can decrease their presence. In the culinary world, Rainbow Swiss chard is used as a salad green and a leaf vegetable, making it a versatile ingredient in the kitchen. It can be used both raw and cooked; cooking will give the leaves a milder flavor. Chard, in general, is used as a substitute for spinach and in tandem with other hardy greens such as kale, leaf mustards and collards. Complimentary ingredients include citrus, garlic, tomatoes, peppers, olive oil, grains such as rice and barley, artichokes, beets, roasted meats and chicken, bacon, cream, cheeses such as pecorino and parmesan and herbs such as basil and arugula. As its genus, Beta vulgaris, suggests, chard is, in fact, a beet that has been chosen for leaf production at the expense of root formation. 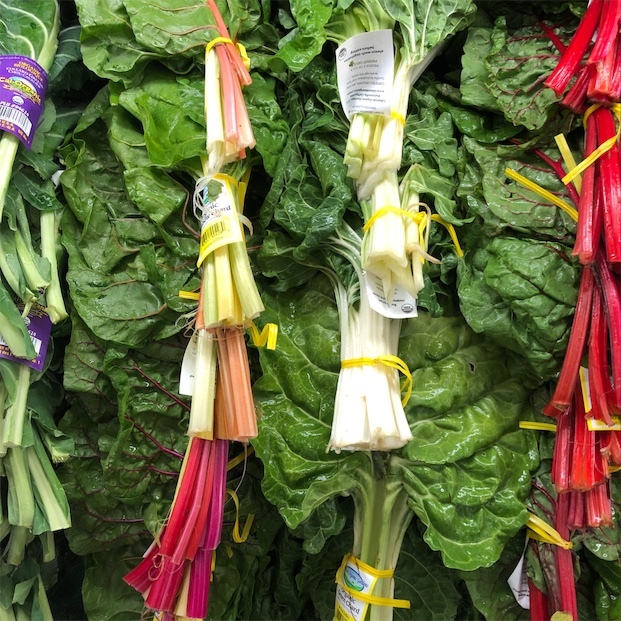 All chard varieties are descendents of the sea beet (B. maritima), a wild seashore plant found growing along the Mediterranean and Atlantic coasts of Europe and North Africa. Documentation of Rainbow Swiss chard cultivation dates back to 1636 within the book "The Herball or General History of Plantes", however commercial exposure to Rainbow Swiss chard wasn't until the 19th Century. It was in that era in 1888 that Rainbow Swiss chard first appeared within the Vilmorin Seed Catalog. It is grown both ornamentally and as a food crop. Rainbow Swiss chard plants thrive in cool summer temperatures, but are tolerant of heat and humidity, thus they are adaptable and easy to grow. If you grow chard as a food crop, you will need to protect it from rabbits, deer and birds. Recipes that include Rainbow Swiss Chard. One is easiest, three is harder. 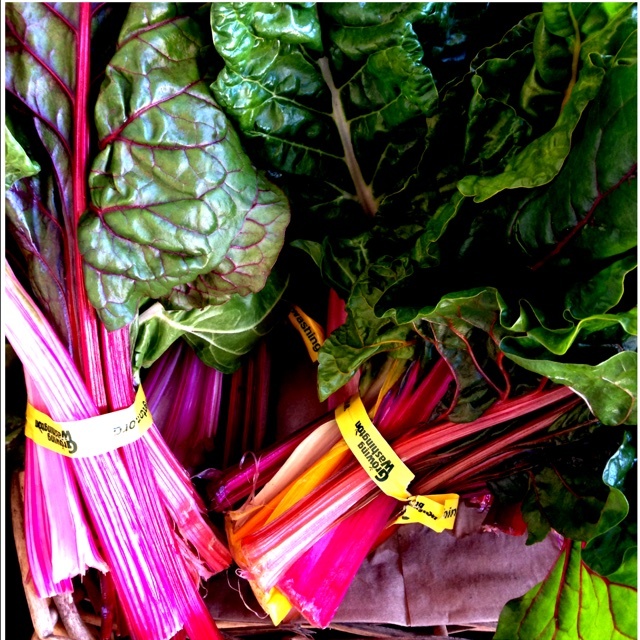 People have shared Rainbow Swiss Chard using the Specialty Produce app for iPhone and Android. 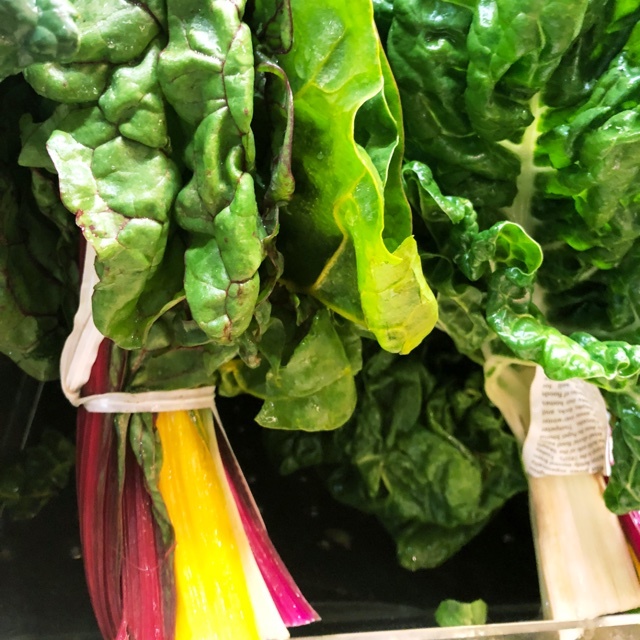 Sharer's comments : Rainbow Swiss Chard spotted at Little Italy Mercato. 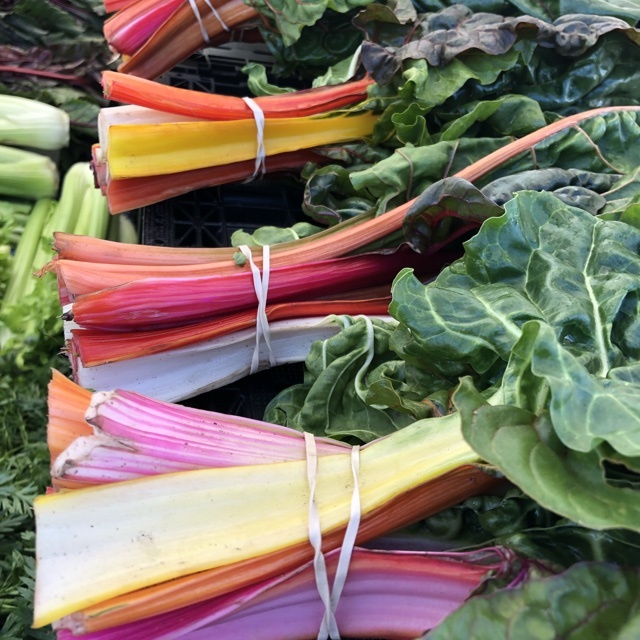 Sharer's comments : Rainbow Swiss Chard spotted at Leucadia farmers market . 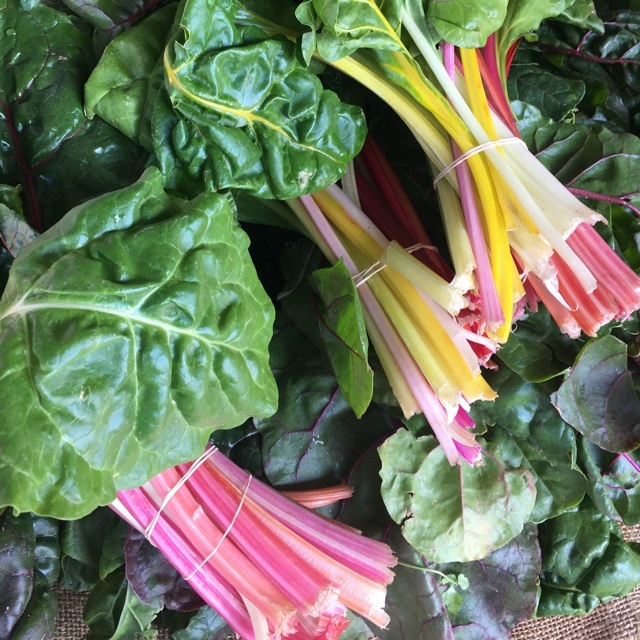 Sharer's comments : Rainbow Swiss Chard spotted at Brentwood Farmers Market. Beautiful and great sauteed! Sharer's comments : Rainbow Swiss Chard spotted at First Alternative Natural Foods Co-Op. Sharer's comments : Rainbow Swiss Chard spotted at Queen Anne Farmers Market. Certified organic, local, and colorful! 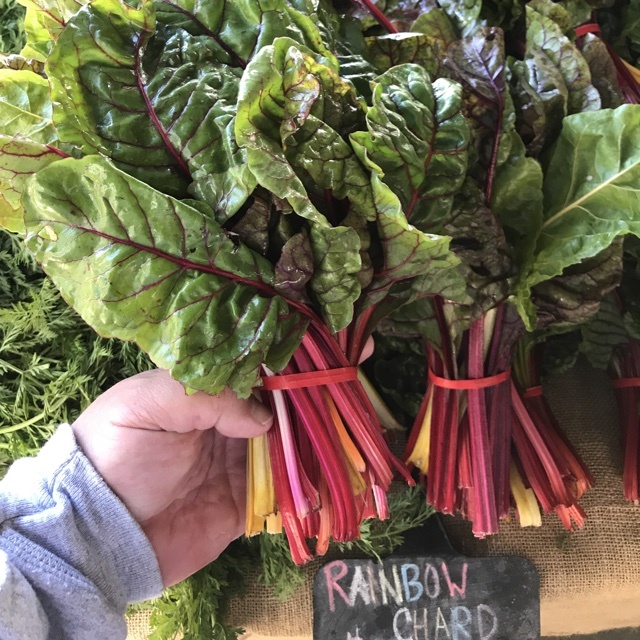 Sharer's comments : Rainbow Swiss Chard spotted at isabelle farm lafayette co 80026.